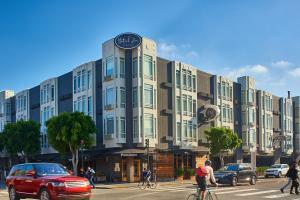 Set in the heart of the Fisherman's Wharf, this hotel is moments away from the waterfront, Ghirardelli Square, Pier 39 and the San Francisco Maritime National Historical Park. Relax in guest rooms and suites featuring high-tech touches, luxe amenities, a 50" HDTV and more. Enjoy delicious Italian fare at Pescatore, a classic trattoria featuring fresh seafood and Italian favorites. Located in San Francisco's Fisherman's Wharf, East of Ghirardelli Square.